Some days when I think about comfort food, I think about a whole roasted chicken with potatoes and then there are other days when all I can think about is having a big bowl of vanilla bean ice cream with hot fudge sauce(oh yeah!) But on most days and definitely today, I think about a hot plate of fried rice, like this one. This plate has the perfect balance of sweet and spicy and all of my favorite ingredients. This takes me back to my first visit to Thailand. I ordered this dish all the time because it came served inside a pineapple but mostly because it taste just amazing. I try to make this as often as I can or whenever I buy fresh pineapples at the store. I guess you can use canned pineapples but please try not to. Fresh pineapple makes such a huge difference in terms of flavor and texture. When making fried rice, it is always best to use a day old cooked rice. 1 cup fresh pineapples cut in bite sizes. 1. Heat the oil in a pan.Then add in shallots, garlic,red pepper and cashews and stir fry about a minute. 2. Then add in the shrimp and stir fry till it’s cooked and then add in the raisins. 3. Then mix together the chicken stock, fish sauce, soy sauce, curry powder and sugar and set aside. 4. 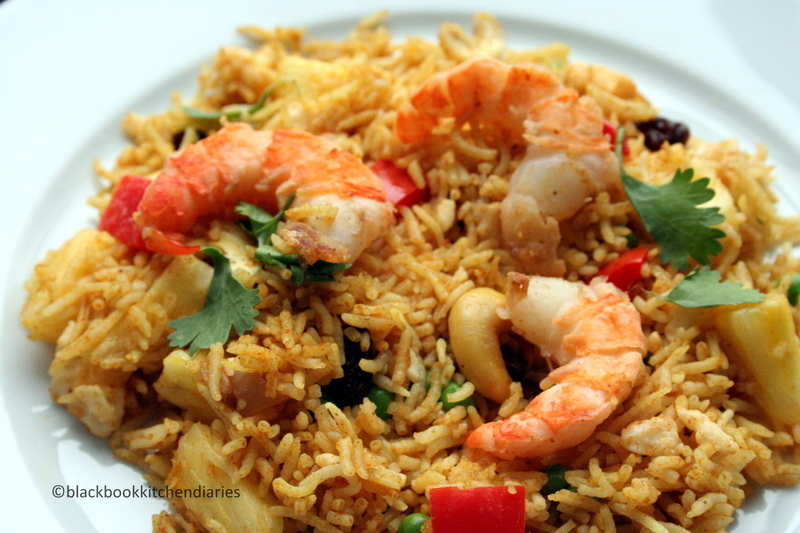 Add in the rice with the shallot and shrimp mixture and continue to stir fry and break up the rice clumps. 5. Now add in the chicken stock mixture over the rice and mix them in. 6. Then add the beaten eggs and continue to stir fry for a few minutes. 7. Finally add in the pineapples, peas and cilantro. Give it a taste test to check for seasoning before removing from heat and then garnish it with a little more cilantro if desire. 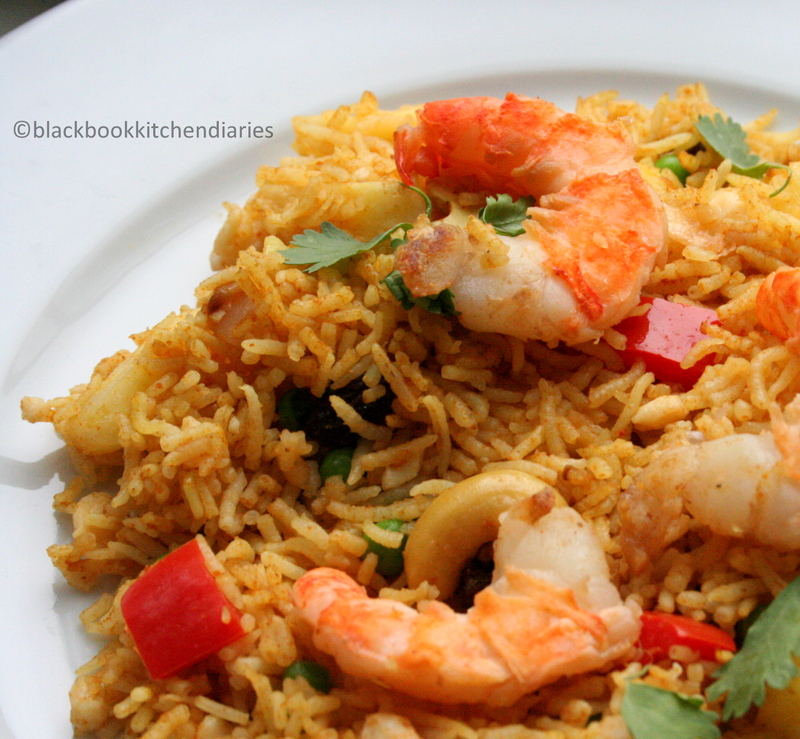 I adore fried rice too…definitely a comfort food for me. But I’ve never tried it with pineapple (which is such a brilliant idea! I love the mixture of sweet and spicy!). Thank you for sharing and offering me a new version of one of my favorites. This Kind of reminds me of my dinner tonight – Indian Food! If only I could make it as good as the restaurant does… that is my ideal comfort food. This looks perfect…what a great combination of flavors and textures! Saving this one! Oh my Lord this looks Heavenly! I MUST make this soon. I’m officially starving now that I’ve looked at this pic! you are stealin my heart with this dish — I love the cashews pineapples and the surprsing addition of raisins — sweet and savory is one of my favorite flavor combinations!